The beginning of the Great War was marked by a surge in patriotism which saw queues of volunteers at military depots eager to join the �just and noble cause� of making the world safe for democracy. However, by the end of 1916, as the Somme Offensive was coming to an end, a new mood of grim realism and patient endurance began to prevail as the reality of the terrible horrors of industrialised war, denoted by the seemingly endless casualty lists documenting the outpouring of the lifeblood of young British men on the Western Front, had become clear to those at home. At this point, the government recognised the need to show some form of official gratitude to the next of kin of the many soldiers and sailors who had died on active service, a decision which, perhaps remarkably, implied an intractable faith in ultimate victory. This state gift to relatives took the form of a Bronze Memorial Plaque designed by the sculptor and medallist Edward Carter Pearson in a competition which received over 800 entries from all over the Empire. His winning design �pyramus� later came to be known, variously, as the �Dead Man�s Penny�, the �Soldiers Penny� the �Next-of-Kin Plaque�, or the �Death Plaque�. Carter Pearson�s design contains the inscription (S)HE DIED FOR FREEDOM AND HONOUR and depicts Britannia respectfully bowing her head whilst granting a crown of laurel leaves, symbolic of triumph, onto a rectangular tablet bearing the full name of the fallen. The dolphins represent Britain�s naval power, and the lion represents Britain�s strength. Over one million plaques were produced with 600 being issued to women who had served under direct contract with the War Office, such as in the Q.A.I.M.N.S. and Q.M.A.A.C. The plaques were sent to the next of kin with a scroll whose text conveyed the respect and gratitude of the country for the ultimate sacrifice that the fallen and their loved ones had made, together with a letter from King George V which read �I join with my grateful people in sending you this memorial of a brave life given for others in the Great War�. After the war, the plaques and scrolls, along with the deceased�s medals, were proudly displayed in homes throughout the country, many in the form of small domestic shrines. However, as time passed, the Death Plaque, like many smaller war memorials, passed out of memory and became largely forgotten and unnoticed. Today, with the surge of interest in the First World War that has occurred since the early 1960�s, a vast international trade in militaria has developed, and objects such as the memorial plaque, together with trench art and other ephemera from the conflict, are now collected, traded and displayed in public and private collections. 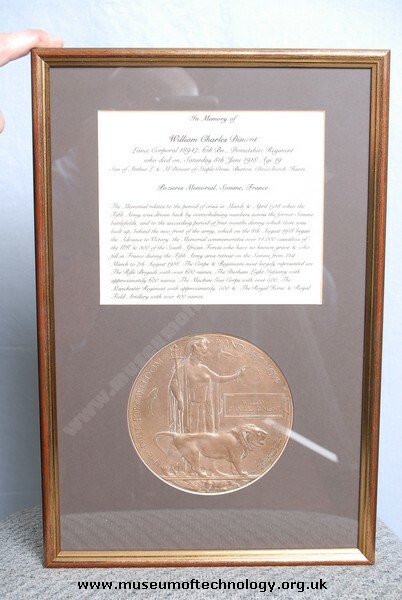 The author of this piece has The Memorial Plaque which commemorates the death of her paternal great-grandfather, William James Collins, on 24th November 1916, of wounds received at the Battle of the Ancre, the final act of the Battle of the Somme. Tragically, the day of his death marked the second birthday of his only daughter, the author�s grandmother, Elsie Kate Codd, n�e Collins. Her mother, Kate Collins, had died giving birth to her, and thus the death of her father when she was just two years old left her an orphan of war. The Penny was the only memento she had of the father she never knew and took pride of place in her home for over 70 years. The author remembers her polishing the Penny every week, a sacred act of remembrance which may have served to invoke memory and helped her to navigate grief, loss, and emotion across the years.